Soy sauce also known as Tamari or soya sauce is made from soybeans which are known to be a great and cheap source of protein. 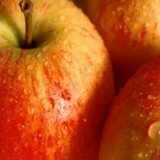 It is mostly a source of Manganese, Protein, Niacin (Vitamin B3) and Tryptophan. It's low in calories and does not contain any fat, that is, total fat, saturated fat, trans fat and cholesterol. Niacin has been found to boost our health by reducing the levels of LDL "bad" cholesterol and increasing the levels of HDL "good" cholesterol. This in turn means a good, healthy heart for you. The Manganese helps in the clotting of blood amongst many other things. Studies have shown that Tryptophan helps to make Niacin as well as promote stable moods and healthy sleep. 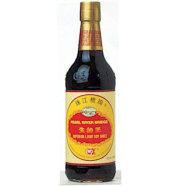 There are mainly four different types of soy sauce, that is, light, dark, slowly aged and chemically manufactured. The difference between light and dark soy sauce is that dark soy sauce has a much thicker texture and a darker, brownish-black color as compared to its light counterpart. This is mostly due to the fact that dark soy sauce is aged for much longer a time than light soy sauce. It is also used more in marinades. 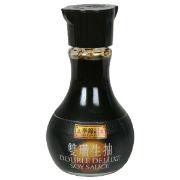 Light soy sauce is obviously lighter in color and texture and also has a saltier flavor. It is used more in and after cooking. When you look at the latter two types, you will find that the chemically manufactured soy sauce is produced within a matter of days and is seasoned with salt, corn syrup, water, coloring and caramel. The traditionally prepared soy sauce is a mixture of soybeans and roasted grain which is usually either rice, barley or wheat. This mixture is then fermented for a couple of months. 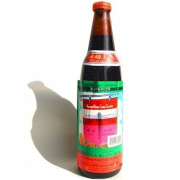 One will also find that often, chemically made soy sauce has a metallic taste to it. 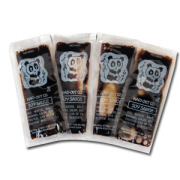 One of the main concerns for a lot of people with soy sauce is its high sodium content. This will especially be a challenge for one who wants to lead a healthy eating lifestyle. A diet rich in sodium may lead to health problems such as high blood pressure which in turn can lead to other complications such as kidney failure, heart disease and stroke just to name a few. Another of the concerns is the fact that soy sauce, seeing as it is a soybean product, may cause allergic reactions. Soybeans are in the top 10 list of foods that individuals may react to. Topping that list is cow's milk. One may be allergic not only to the food item but its by products too. If one is allergic to soybeans, they may need to keep a distance from soy sauce. We will now take a look at some soy sauce nutrition facts. The percent daily values (DV) are based on a 2,000 calorie diet. Your values may be higher or lower depending on your daily calorie needs. Although the sodium has been reduced in this Kikkoman reduced sodium soy sauce, it will still be considered as a high sodium food. 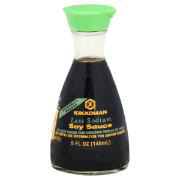 Kimlan soy sauce nutrition facts shows that when compared to light soy sauce just below, it contains less sodium. Although of course, still high. Light soy sauce has a pretty high amount of sodium. Much care needs to be taken when using it. 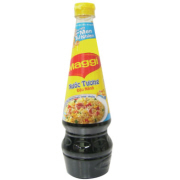 Maggi soy sauce would be one of those that would be considered to be on the "low" range of sodium. Although generally speaking, it is a high sodium food. 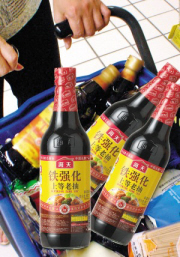 Premium Dark Soy Sauce is a source of protein and carbohydrate. It's sodium content is slightly higher than that of maggi soy sauce. Sweet soy sauce contains much less sodium than most soy sauces although when compared to the others, it is slightly high in calories, though this is nothing to run home about! It is also a good source of the mineral Iron. Soy sauce packet has just about the same amount of sodium as sweet soy sauce but it's much lower in calories and Iron content. So be weary when you use your soy sauce. Use a dash, a splash or a tad bit here and there to avoid excessive intake of sodium.